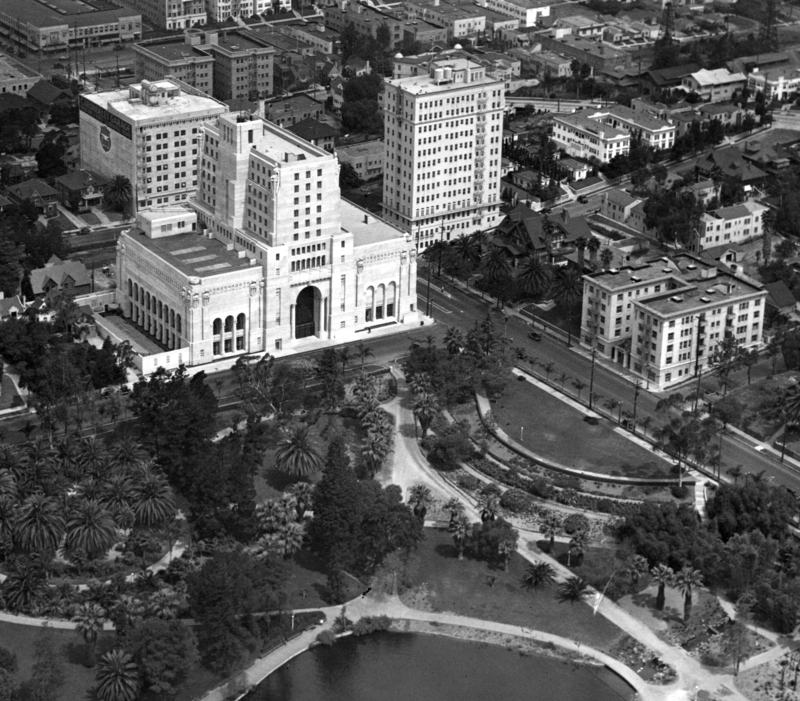 The classic Regent Apartment (1913-1983) facing Westlake (MacArthur) Park once co-starred with Charlie Chaplin, and appeared in other silent productions with Lois Weber, Mack Sennett, and Hal Roach. As shown here, the Regent’s front entrance portrayed the restaurant where Charlie worked as a waiter in The Rink (1916). Time is fleeting. This haunting image, Charlie’s ghost superimposed over the ghost of a long lost vintage apartment, really moved me. For the first time, more than 100 years later, we can appreciate Charlie’s movie environment when filming The Rink, but only decades after it was all destroyed. Left – east on Hollywood towards Cahuenga, Wife and Auto Trouble (1916) – right, west at the same spot, Tillie’s Punctured Romance (1914). For some reason my brain is keenly attuned to pattern recognition. Maybe I would have survived well in the jungle eons ago. But the pieces all came together when TCM recently broadcast the early Sennett comedy Wife and Auto Trouble (1916). The film caught my eye because many scenes were filmed on Hollywood Boulevard at Cahuenga, at nearly the same spot as where Chaplin and Marie Dressler filmed Tillie’s Punctured Romance (1914), only looking east instead of west. One setting from WAAT (left above) seemed familiar, but in the movie it was falsely presented as if set on Hollywood Boulevard when it was not. After checking my library of movie frame grabs, I realized it matched a building portraying a hotel in the silent Our Gang comedy Fast Company (1924)(right above), also broadcast on TCM. Aside from a similar oblique view, which more broadly showed the building corner, Fast Company also provides a front on view of the entrance. Interestingly, I noticed that the decorative pillars flanking the entrance were not flush with the wall – instead, there was an open air gap on the far sides of the pillars as well. So there were three ways, not one, to walk through the pillar entrances to the front door. The Regent – at right – looking over Westlake Park. LAPL. 6th Street, the north street facing Westlake (now MacArthur) Park instead. In one shot (above left) you can clearly read that the building supposedly facing Pershing Square is named the Regent Apartments, which stood at 2401 W. 6th Street at the corner of S. Park View Street. While I was fascinated that Shoes depicted the actual name of the apartment, I also noticed that the entranceway had projected pillars. In other words, there were three ways, and not one, to walk among the pillars towards the front door. So I quickly checked, and confirmed that the Regent appearing in Shoes was the same building as in Fast Company, and thus also appearing in WAAT. But I wasn’t done. Somehow the decorative trim on the entrance pillars seemed familiar. I scanned through folders of unsolved images, when I realized it likely matched the restaurant exterior in The Rink. The details all matched up – another confirmation. While I had a few aerial photos showing the Regent from afar (see above), I searched in vain for a vintage street level image. Unsuccessful, I contacted some colleagues for help, and was thrilled when Historic Los Angeles blogger Duncan Maginnis provided me with a link to these USC Digital Library images (above). They weren’t indexed under the name “Regent,” but somehow Duncan was already aware of these photos, and passed them along. During Shoes the Regent appears in full view, just part of the background across the street. So you can see there was more than one way to pass through the entrance. Interestingly, the three movies to film there closer up hid this detail. Either they filmed the entrance obliquely, looking up the street (above right), so you wouldn’t easily notice the other entranceways, or it they filmed in tight close up (above left), cropping the other entranceways from view. As I report in my book Silent Traces, Chaplin filmed the scenes of Edna Purviance’s apartment in A Woman of Paris (1922) nearby (above), at the Ansonia Apartments at 2205 W 6th Street, just two short blocks east of the Regent. So Chaplin was on familiar turf when he returned her with Edna. 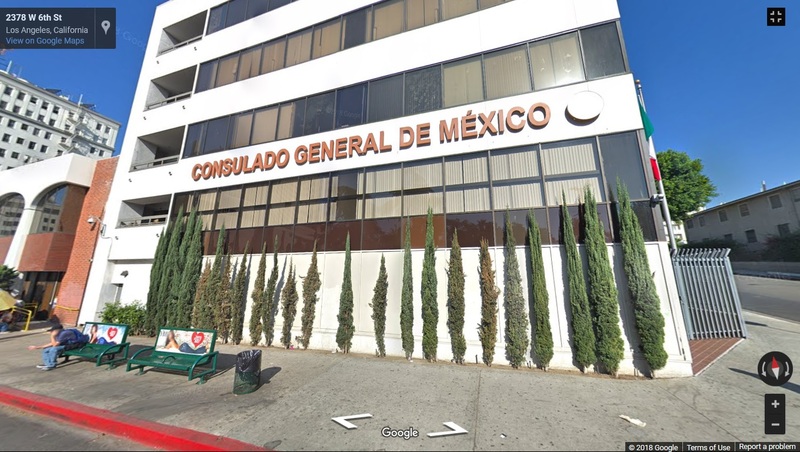 The Regent was demolished in 1983, and an 80’s style “modern” office building stands there today in its place, home to the Consulate General of Mexico. Below, the site of the former Regent Apartments. This entry was posted in Charlie Chaplin and tagged A Woman of Paris, Ansonia Apartments, Fast Company, Hal Roach, Lois Weber, Mack Sennett, Shoes, The Regent Apartments, The Rink, Tillie's Punctured Romance, Westlake Park, Wife and Auto Trouble. Bookmark the permalink. 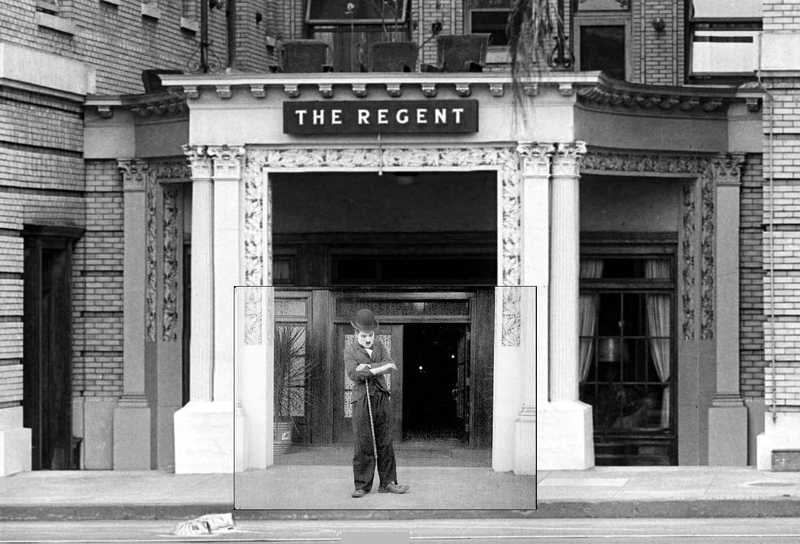 Thanks Bob – that first image, Charlie superimposed over the Regent, is one of my all time favorite discoveries. There’s just something haunting and wistful about this ghost upon a ghost – all long since gone. Thanks for this John. The scene from Tillies puzzled me for some time, as Mabel Normand appears from what appears to be a garden gate – somewhat incongruous within the urban setting on Hollywood Blvd. The long shot from Wife & Auto Trouble proves that this shot was carried out on a set, necessary perhaps due to the Mabel close-ups.